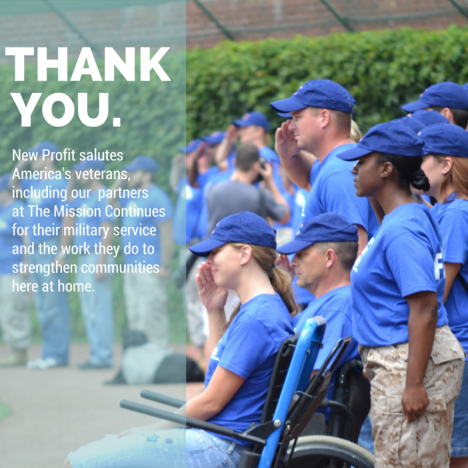 In honor of Veterans Day, we're spotlighting the important and inspirational work of one of our portfolio organizations, The Mission Continues. Founded by Navy SEAL and Rhodes Scholar Eric Greitens in 2007, and now helmed by West Point grad, Harvard MBA, and Blackhawk pilot Spencer Kympton, The Mission Continues empowers veterans facing the challenge of adjusting to life at home to find new missions, redeploying them in their communities to serve their country in a new, but equally important, way. The Mission Continues’ Fellowships harness veterans’ strengths, skills, and their compassion and empowers them to volunteer with non-profit organizations in their community on a daily basis. Their Service Platoons bring teams of veterans who are working together with partners at the local level to build stronger communities and tackle pressing issues. Since their founding, they have awarded over 1,100 Fellowships and now have over 2,000 Service Platoon members. "We focus the innate spirit of service demonstrated by the men and women of the US military. We mobilize wide-ranging support from volunteers, non-profit organizations and donors. And together we are able to solve some of the most challenging issues facing our communities. Through this unique model that provides reciprocal benefit for the veteran and the local community, veterans volunteer to help others and, through their service, build new skills and networks that help them successfully transition home." New Profit first invested in The Mission Continues in 2011. We strongly believe that The Mission Continues’ unique philosophy to regard veterans as assets and challenge them to continue serving in their communities not only helps the veterans in their program effectively reintegrate into civilian society, but also powerfully transforms the opportunities and trajectories for all returning veterans, thereby improving opportunity and infrastructure in America. To the veterans of The Mission Continues and all of America's veterans, today and always, thank you for your service.